After a lifetime as a proud agnostic, Sue had a life-changing experience two years ago that led her to becoming a devoted follower of Jesus. Hear her story of transformation and learn tips on living out faith as an open follower of Jesus in Silicon Valley. Sue's talk kicks off NBCC’s “Smart” message series, inspired by the the life of Jesus and “hungry, humble and smart” in Patrick Lencioni's book "The Ideal Team Player." Sue Warnke has over 19 years of experience in the technology industry and is currently the Senior Director of Engineering Content at Salesforce, the world leader in Customer Relationship Management software. Other roles include Director of Innovation and Leadership, where she worked with Microsoft, Uber, SAP, Intuit, Sony, GAP, and Warner Bros. She has a Masters in English and was profiled in Liz Wiseman’s best-selling leadership book, Rookie Smarts. 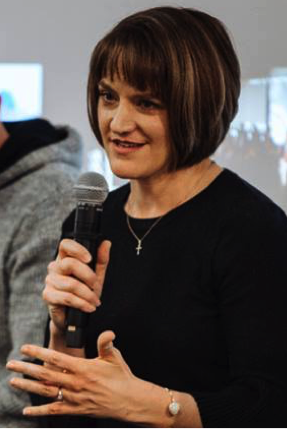 After a lifetime as an agnostic, Sue became a Christian in 2017 and now leads Christians@Salesforce as well as Faithforce San Francisco, Salesforce's interfaith Employee Resource Group that is sparking conversation on Faith Diversity in the Marketplace. She lives in Pacifica, California with her husband Chris and three teenagers.